When you hear the word “portrait” odds are you think about those old presidential portraits which hang in museums. Or maybe you think of the awkward family photographs you sat for at Olan Mills. However, portraits don’t have to be boring or awkward. 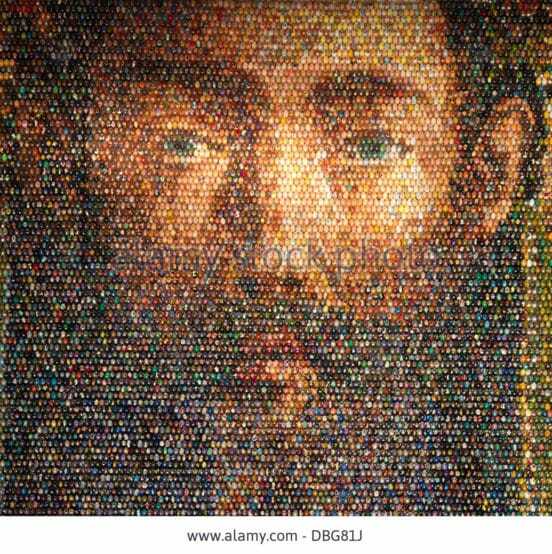 These artists have made a living painting – or assembling – portraits out of a variety of materials. Nick Gentry uses something from the 20th century that is no longer relevant and creates beautiful portraits with it. 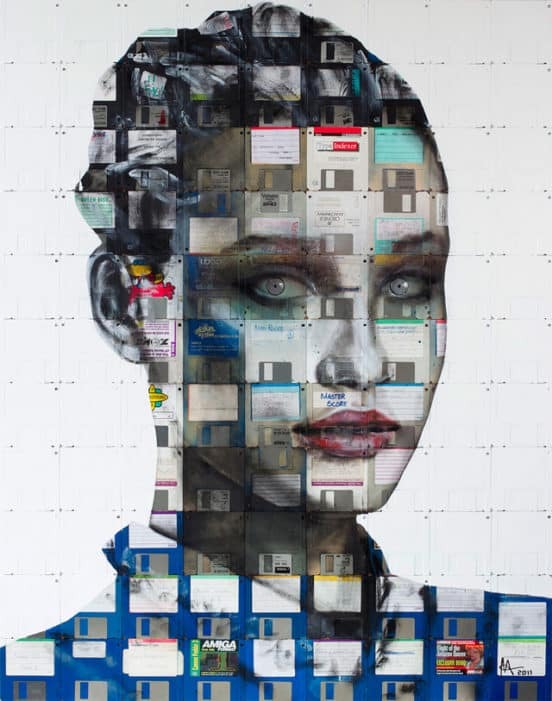 He uses floppy disks to paint portraits. Gentry’s art also incorporates other items from the era – like VHS tapes, cassettes and polaroids – to explore the constantly changing digital culture. 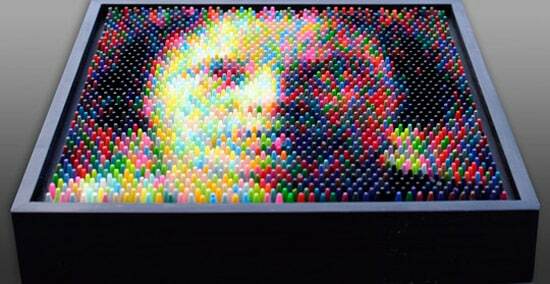 Christian Faur makes 3D portraits out of crayons. He melts down wax crayons and then creates amazing portraits with perspective and depth. Faur explains that the images appear to change when they are moved, or viewed from up-close. But when you zoom out, you can read the horizontal text. It’s a great way to remind one of their first box of crayons. This is no ordinary replica of the Mona Lisa. It is actually the cumulative product of a whopping 3,604 cups of coffee. The gradients were achieved by using various amounts of creamer. This enormous project is 20 feet high and 13 feet wide. Eight artists working for three hours collaborated to brew up a delicious facsimile of the original. It was displayed at the Sydney Harbour. Dutch ad agency Van Wanten Etcetera started this campaign to promote Dutch Book Week. Each year, the Dutch celebrate a different genre of book. 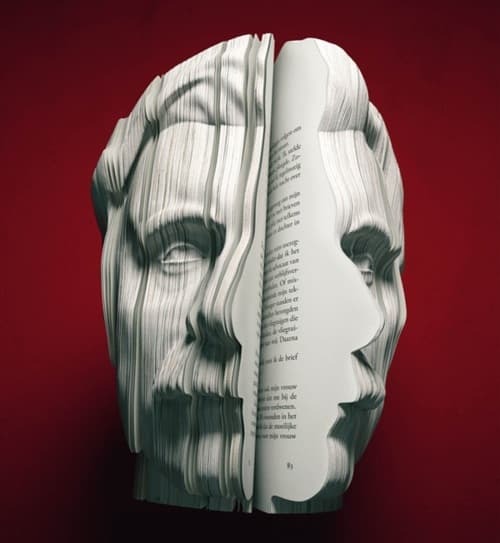 For autobiography, Van Wanten used the books themselves to create portraits of the authors’ faces. Markus Ravenhorst and Maarten Reynen were the braintrust behind the idea, with artist Souverein completing the work. Ukrainian Oksana Mas makes larger than life portraits out of hand-painted wooden eggs. The technique is modern and also incorporates the traditional Ukrainian art of hand-painting Easter eggs. These paintings are large mosaics that are stunning to behold. Molly B. 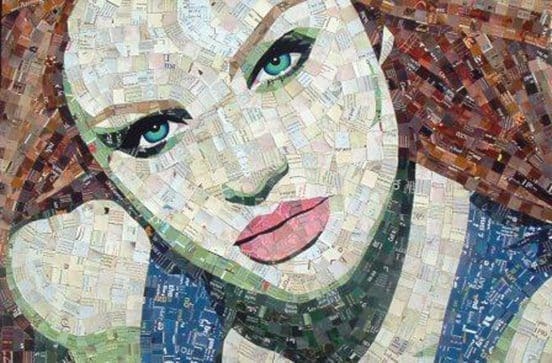 Right is right on the money with these portraits crafted from vintage bottle caps. Her process starts with painting a portrait on a large piece of sheet metal. 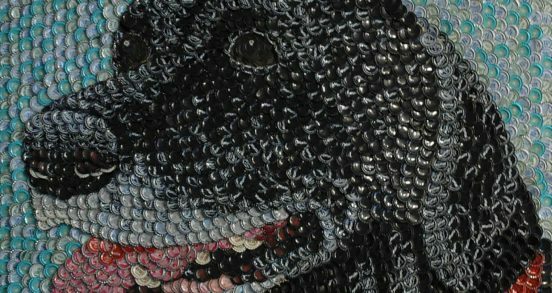 She then accentuates the portrait with metal caps which are glued onto the metal,overlapping “like scales of a snake.” The paintings can weigh up to 70 lbs. 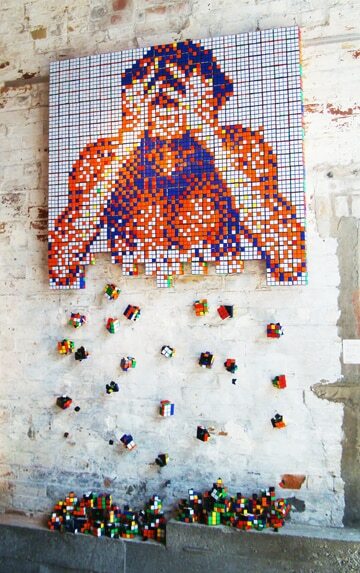 Everything 1980’s is new again, and Cube Works Studio is here to celebrate the ubiquitous Rubik’s Cube craze of the era. The studio is a collaboration between graphic artist and architects with cubers who make portraits with the popular puzzle. They make amazing versions of the pop art that was also popular in the era.